Reading Born in the village of Barama, in the Chittagong District of erstwhile British India, Somnath Hore was a prolific sculptor and a premier print maker, having invented and developed novel techniques, including the famous pulp-print technique. In ‘Until The Rain: Fragments from an Artist’s Life’, Hore recalls a childhood incident which sheds light on his early fascination with visual and artistic representation. As the years passed and Hore’s affiliations with the Communist party deepened, his work reflected the anguish of ordinary people ravaged by the major historical and political crises in 20th century Bengal, such as wars and famines. 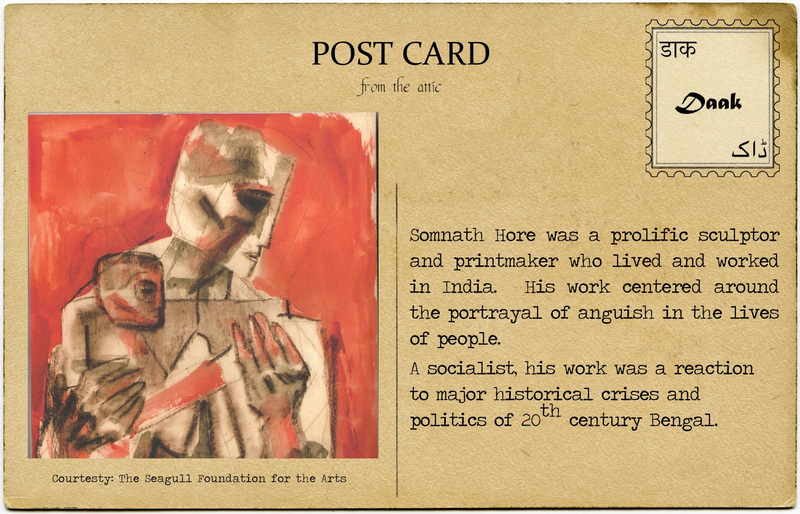 Through the years, Hore also held various positions at the Indian College of Art and Draughtsmanship, Calcutta, the Art department of Delhi Polytechnic (later the Delhi Art College) before going on to teach at Kala Bhavan, Santiniketan. He was the recipient of the Padma Bhusan (posthumously), the Aban-Gagan Puroshkar, the Lalit Kala Ratna and the Rabindra Bharati University Award, among many others. Despite the acclaim and adulation he received for his work, Hore remained true to his socialist beliefs and led a quiet life. Unlike others in the art world, he refused to escalate the price of his artwork, always insisting that it remain within the reach of the masses.